Accu-Therm Hot Packs: Our Accu-Therm Hot Packs Feature A Reinforced Soft Nylon Pliable Poly Bag With Heavy Duty Seal That Is More Comfortable And Conforms Better Than Our Standard Hot Pack. Our Standard Hot Pack Features A Standard Weight Poly Bag. 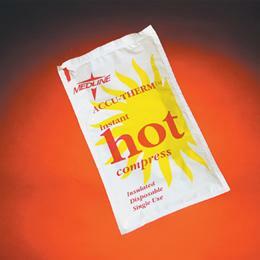 A Compress Holder Is Required Because These Hot Packs Should Not Be Applied Directly To The Skin. Insulated, 6" X 10".